What says "Cheers to 50 years!" 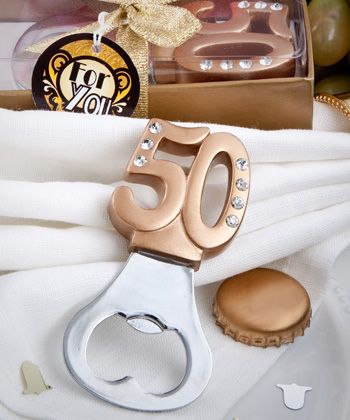 better than a our 50 bottle opener favors? 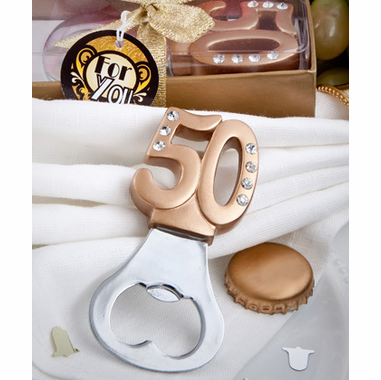 When you are seeking a useful momento to give the guests who attend your 50th birthday party, golden anniversary or you are celebrating 50 years in business, this bottle opener is an affordable option. The bottle opener measures 3.25" x 1 5/8" and is manufactured with a gold resin "50" with rhinestone accents to add a little bling. The opener base is silver tone metal chrome for sturdiness. Each comes packaged in a clear top display box with gold base and is wrapped and tied with a gold metallic ribbon. A round "For You" tag is also attached.